* Campaign games – If your core force is extremely large, then the only way the AI will be able to have sufficient points is to be the delayer or defender. Therefore the human player will see more assault and advance missions in this case. * Planes which crash off map should now show the entire points value for the aircraft, not the damage at the point it was shot down. * Random games will generate fewer low visibility conditions than before. * A code quirk, some might call it a bug, that allowed players, particularly PBEM players, the ability to Z-Fire or X- Smoke into a hex with on map artillery then go to the bombardment menu and get a 0.1 delay for a full bombardment has been eliminated. It is no longer possible to do that and a side benefit for some players, but perhaps not to the players who loved to do "recon by Z-fire", is that it is no longer possible to Z-fire into a hex then repeat, repeat, repeat using the F key. Every Z fire now needs to be done individually because after a Z-fire the process is now reset to zero after each Z-Fire so that hex cannot be used to circumvent the artillery bombardment routine delay. * Vehicles will now show drop shadow on paved road. They didn't for years. Now they do. * 14 scenarios that Don Lazov resurrected from old archives have been added and updated. * A bug that has existed in the game back to before we started working on the code has been found and eliminated that affected paved road in particular when it was manually placed on a map but not when the map was auto-generated by the game. The bug, in slightly different forms, affected streams as well as hedgerows when placed on the map but then had sections removed and then added back in again, if the mapmaker did not place the terrain on either side of the gap then in some cases it would appear the terrain was there but the game recorded and treated that hex for sighting and movement as being whatever the underlying terrain was. This bug fix not only corrects that problem for any new maps made but also in pre-existing maps and scenarios where the problem was mostly confined to hand made maps that used paved road as before this release if a map maker placed a paved road in a 5 hex line there would be paved road showing in all five hexes but the last hex placed would show a road tile but it was not being recorded as a road and this means if a map maker added small sections of road to a map and each time started the next section after that last hex showing a road was being built with many breaks that could not be seen but anyone driving down that road you would not be getting the full road allowance as you would passing over sections of the underlying terrain even though it appeared to be a road. The bug did not cause a problem with secondary roads as secondary road code was slightly different, and still is, as it only placed a tile up to the last hex but not on it. In the case of streams, it was placing a "ford" on the map every time you started a stream which isn't such a problem as the roads but it was unintended and in Hedgerows, it was not giving the proper density to the first hex in the line for sighting purposes. However, all these little problems, that were not so "little" to fix, have been eliminated so now WYSIWYG and all old maps and scenarios will be automatically purged of these issues when using this new EXE. * UnitClass Commandos now have the same parachute ability level as Paratroops so they suffer fewer casualties when landing. * Maps will now save crater damage again. * Ammo containers can be loaded onto trucks. 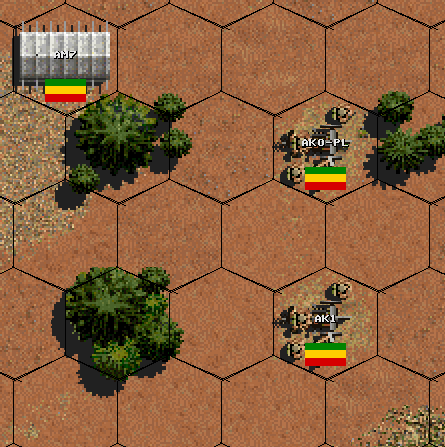 * Fewer objective flags will be auto placed on mud hexes in generated battles. * There is now a slightly higher chance of flaming wrecks blocking LOS. * The Replay key Y / N will no longer play UNLESS Y or N is pressed. Formerly any key other than N set off the replay. * Airstrikes set for specific in and out points in scenarios should now "follow orders". 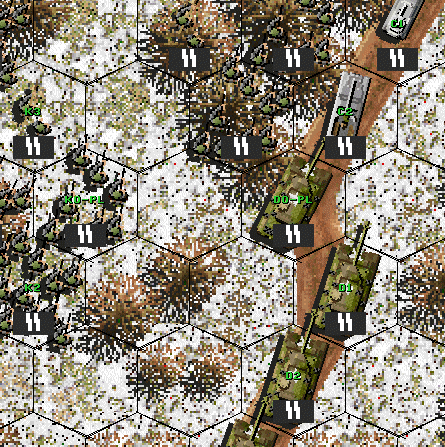 The AI was sending them in at random directions as it would in a generated battle but they should now behave as the scenario designer set them. * The formula for calculating aerial bomb ratings has been adjusted so the "little" ones are more effective and are not so much worthless wet firecrackers any longer. * CD owners Only. ( winSPWW2 only--- this function was not added to winSPMBT ) There is a new feature that allows CD owners / scenario designers primarily, the ability to change the ID tags and Victory Hex Flags to either an existing OOB or from a set of tags and flags that have been added to the SHP files for nations not covered by a full OOB which allows scenario designers the ability to customize scenarios and simulate nations not covered by the normal game OOB's. That procedure is detailed in the CD section of the game guide. * CD owners Only- As the result of code changes to the way the game displays terrain graphics, there are now 8 game display levels. Three more than previous, each of those allow you to zoom in closer to units on the map. The base zoom level, the one you see when you first start up the game is Z4 and previous versions of the game also allowed you to zoom in 1.5X closer than Z4 using Z5 but the new zoom-ins allow 2X closer than Z4 using Z6 and 3X closer than Z4 using Z7 and 4x closer than Z4 using Z8. How this will look to each gamer depends on what size your monitor screen is and what resolution it uses so in some cases with older, smaller monitors the greater zoom-ins may not be as useful to you as they would someone with a large monitor that displays at very High resolutions. * CD owners Only- There is now a Delete button for the scenarios page like the one for saved games. * CD owners Only- There is now a GoTo button in the Campaign Editor scenario links page. 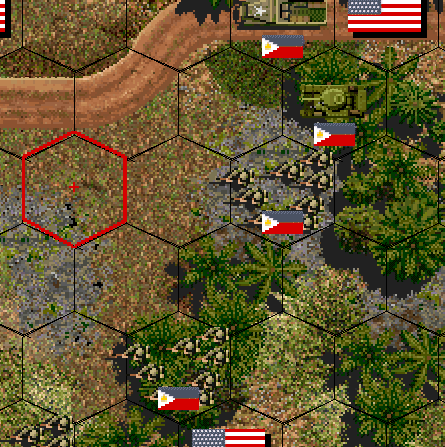 * CD owners Only-Pressing [ on your keyboard will show the victory hex values under the V hexes. * CD owners Only-Pressing ] on your keyboard will force V hexes to the top of all building rubble, as well as smoke and units, so they cannot be hidden in any way. Just remember when this is on it may hide units as well so it is intended for temporary use only. * CD owners Only- Scenhacks "Nation" button will no longer switch the entire OOB from one nation to another only the ID tags now. * CD owners Only- Scenhack now shows the Scenario number and they are no longer being added to the CMT file. * CD owners Only. There is a new “find text” function in the Scenhack utility that allows players to search through all scenario description text files to find specific text references. Once the search is run this new feature will provide a list of the scenarios in order, that match the search inquiry, For example, perhaps Arnhem or D-Day or Berlin is entered and all the scenarios with that word or phrase used in the scenario description file will be listed. You can then click on the one that interests you and you will be taken to the "Scenario Fixer" tab and read the scenario description by clicking on the Scenario button. It can also be very handy for finding scenarios created by a specific designer. Simply enter the name and it will provide a list of any scenario that has that designers name on it. As well, scenhack now allows SQL's database queries to be saved and loaded from a new folder placed in the game named 'SQL". The usage of these functions is explained on the CD features / Scenhack section at the end of the game guide. * CD owners Only. There is a new "Units In Hex" feature for the Full CD game that allows you to select the unit you want easily when you have multiple units in a hex. The top unit shown is the one you clicked on and is the "active" unit that you can move or fire or whatever you want to do but let's assume you want to use the observer team to call artillery, Click on that unit and the list will re-order and change. Now the Observer team is the unit you have direct control over in that hex and if you wanted to select one of the rifle sections just pick the one you want and it will appear at the top of the list and that is the one you have control of. PLEASE REMEMBER. SECURE PBEM GAMES WILL FAIL IF THIS UPGRADE IS EXTRACTED WHILE A GAME IS ONGOING. Last edited by DRG; April 2nd, 2019 at 06:54 AM..
Last edited by DRG; March 18th, 2019 at 07:19 PM..
Last edited by DRG; March 18th, 2019 at 07:20 PM..
Last edited by DRG; March 20th, 2019 at 03:07 PM..
935 occurrence(s) has been found. The release of these upgrades to winSPWW2 and winSPMBT marks 21 years we have been producing the games (1998 - 2019). Normally as we do our final preparations for release we have already discussed in part what we will do for the next years release. However, this year is a bit different as these two upgrades are not only large but have also been unusually stressful to assemble and both Andy and I have agreed that we need a break from this and therefore have no plans for next year beyond perhaps getting through a winter where virtually all our spare time is NOT spent getting game patches ready. After 21 years it will be a hugely refreshing change that we are both looking forward to as we are both burnt out and in serious need of a break from what has been over two decades of never-ending game development. Therefore, there are no plans to release a 2020 upgrade. Once we have had some time away from development and the stress caused by it, we may, or not, consider to continue development but if we do it will be on a much more limited basis focusing on code and existing game improvements and FAR LESS on OOB changes. OOB work on winSPWW2 is frozen. Over 20% of the existing scenarios in winSPWW2 had to be rebuilt this year in one way or another to keep in sync with the OOB changes made this release and as they stand now is the way they will continue to be in the foreseeable future. We are not going to continue to re-work and re-issue scenarios and campaigns for OOB changes that have very little real effect on the way the game plays. Far too much of the time we have available to actually develop the game is spent on OOB change drudgery and the spin-off impact of those changes and it makes it all the more tedious knowing that all that work will have next to zero impact on how the game actually plays. Some may disagree and that is to be expected but all the tools to edit the OOB's have been included with the game with every release so anyone who wants to can adjust the OOB's to suit what they consider "correct". OOB work on MBT may continue but I will not be constantly re-adjusting in service dates for tanks that are constantly under development but never seem to reach troops. When one actually enters service we are interested but the latest delay in their production we do not care about at all. We have found with MBT trying to stay on the cutting edge of equipment only means a lot of rewriting of OOB's over and over. The bottom line is that game development has not entirely ceased but it will be greatly scaled back after these updates and there are no plans at this time to release in 2020. Since 1998 we have released at least one upgrade for at least one game every year and in some years there were 2 updates a year for both of the two games but there were also 2 open heart surgeries, Andy in 2010 and myself in 2015 then a month later I had a stroke, but through all that, updates for these games were produced. There have been increasingly very long stretches in front of the computer and more than a few sleepless nights that can greatly disrupt normal day to day life. As well this year we had to contend with a full HDD failure of Andy's main computer. We were fortunate we had backups but it still meant two weeks of code work had to be redone and as the computer failed just before Christmas we lost an additional 10 days waiting to find out what was wrong so both Andy and I feel we are entitled to a bit of a break from all this and we fully intend to take one. Last edited by DRG; March 22nd, 2019 at 07:58 AM..
Last edited by DRG; April 2nd, 2019 at 06:25 AM..
Don and Andy, thank you so much for all the hard work, effort, and stress you two have put up with and have done for SPWW2 and SPMBT! You both are indeed deserving a well earned rest and respite, thank you for putting up with all our crap all these years. Bless you both and rest/recover well!